I Shredded like a Mouse. Well the bird food was all eaten, and there were mice droppings everywhere. I am referring to the garage. So gross. I am a painter who doesn’t paint at the moment. But I have an abundance of art and painting supplies stored all over the place. I have been waking earlier, that has been good, and getting enough sleep, but I still find my self running like a mad woman. So today I took on the garage in a couple areas, canvases and large framed photos, and one heavy box of documents. I decided after seeing the sunflower seed shells and mice droppings that I best get anything that wasn’t completely sealed out of that nasty garage. Notice the top right corner of the file box has been chewed. I didn’t do that. Look at all these ridiculous papers, I don’t even know the years, maybe 2006, 2007,08 ? 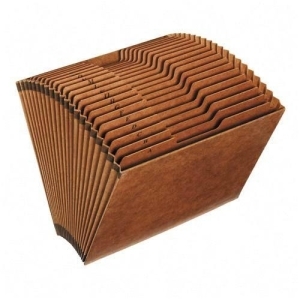 This box was packed full with hanging file holders containing labeled manila folders which were holding these worthless statements and paid bills, for years. It weighed a ton. I decided to move all these various boxes, holding the papers, canvases, and framed photos to my office, where I could sort in peace. Plus I am attempting to get all my art supplies in one area, the corner of my work office. I had to use a hand cart, dolly whatever they are called. Four trips from the car to the elevator to the office. I worked on the box filled with papers first. Out of the entire box I kept only one paid medical bill. One piece of paper. That’s it. 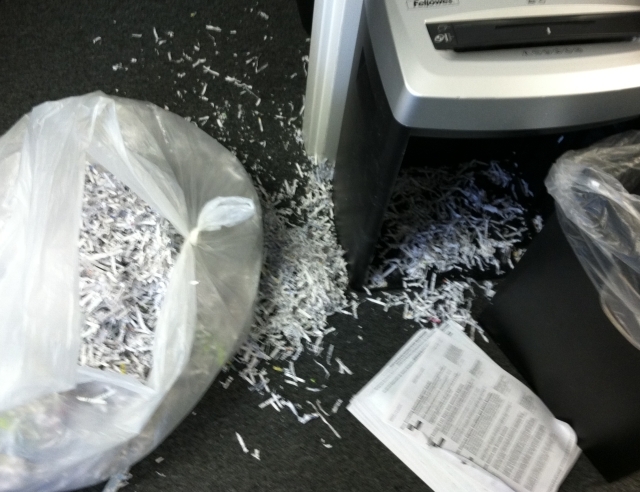 My shredder started acting up, but I got it going again. It made a huge mess in the meantime. I feel bad for making such a mess and leaving it, but we don’t have a vacuum at the office. It will have to wait for the cleaning crew. It’s good thing they are really laid back, every day is good to them. “Better than Russia,” they say. All is good, I am working away so next I tackle the canvases, and large framed photos. They were in boxes that I needed for something else, so I was emptying them. I got to the third one and I SCREAMED. I’m embarrassed to say this but when I see mice I scream. It’s an immediate and involuntary reaction. Especially when they are jumping around frantically. I was lucky I could shut the box in time. I held it closed with one hand and searched for tape the other. 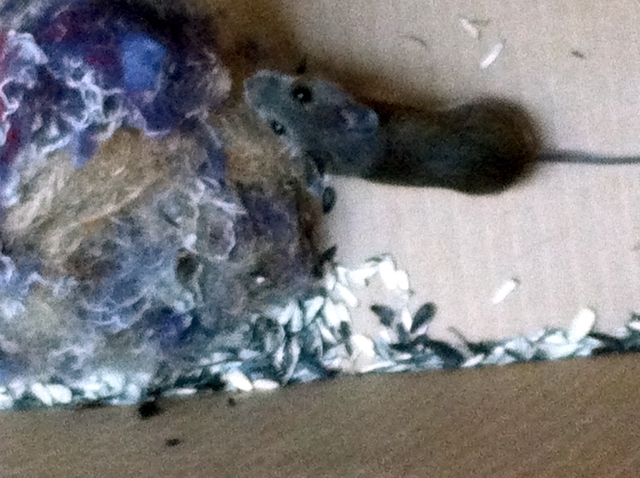 Good thing there was only one mouse. 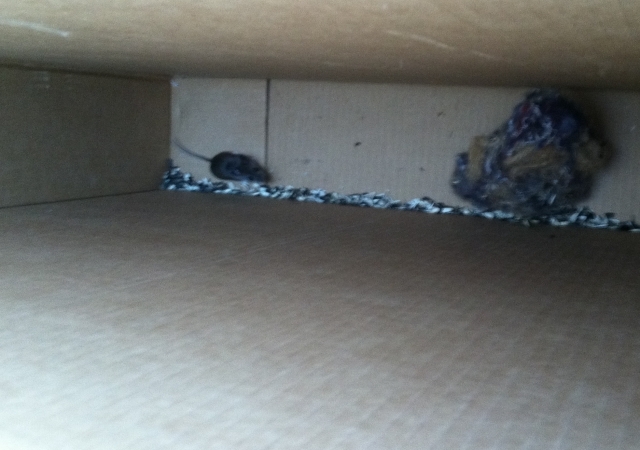 I had to get this mouse out of my office, out of the building and out of this box. I gave him his bedding too. That's all from what he chew off my other things in the garage. So that was my day, more or less. 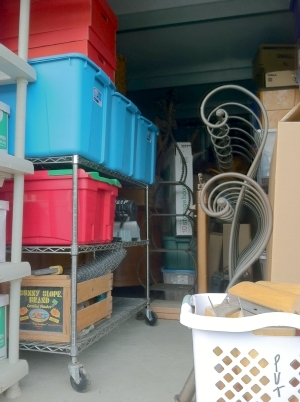 My take away – if you have anything stored outside or in areas where there could be mice, there will be mice, and all your “stuff” is on it way to quickly becoming garbage. I found a pair of shoes that the mice ate. Shoes! Who eats shoes? Those mice were likely making their condo out of shoes parts. Another thing I will suggest since the New Year is coming; buy a cheap accordion file labeled by month or alpha however you like to file bills and such. Mark it 2012, boldly. Only put items in this accordion that are records you can throw away next New Year’s Eve. 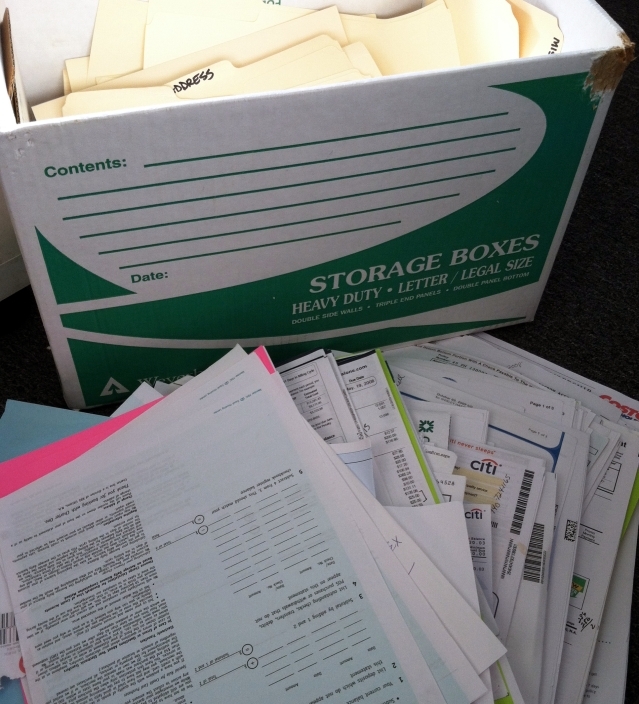 Do not mix important papers, cards, photo or notes with worthless statements and bills. Repeat that to yourself [really for me] – Don’t mix important things with worthless statements and bills. 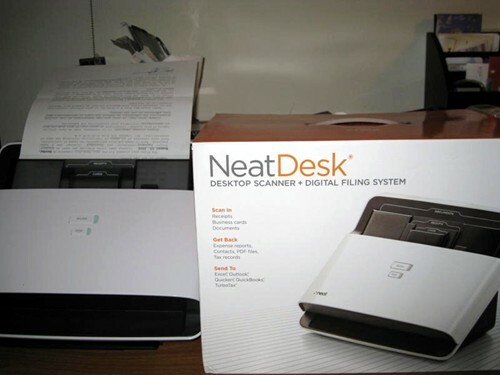 Prepare to destroy this self-contained file in a celebratory fire or toss it at the dump. You can seal it closed with duct tape if you worry about identity theft. Personally, I pity any soul who ever steals my identity, that would be a real bummer for them. I’m feeling more optomistic and much more focused on moving in the direction of my dreams. I guess that’s what people mean when they say the most important habit to have is to be pro-active. If I can get back on track so can you. No excuses. Remember you only have to do one-thing each day! Cheers! This entry was posted in animals, goals, lessons, life, nature, storage and tagged accomplishment, dreams, fear, goals, proactive, storage. I have to admit, I have been avoiding this area of sorting like the plague. As a matter of fact, as I write my stomach is getting tense. You see I don’t want to sort all my old photographs. 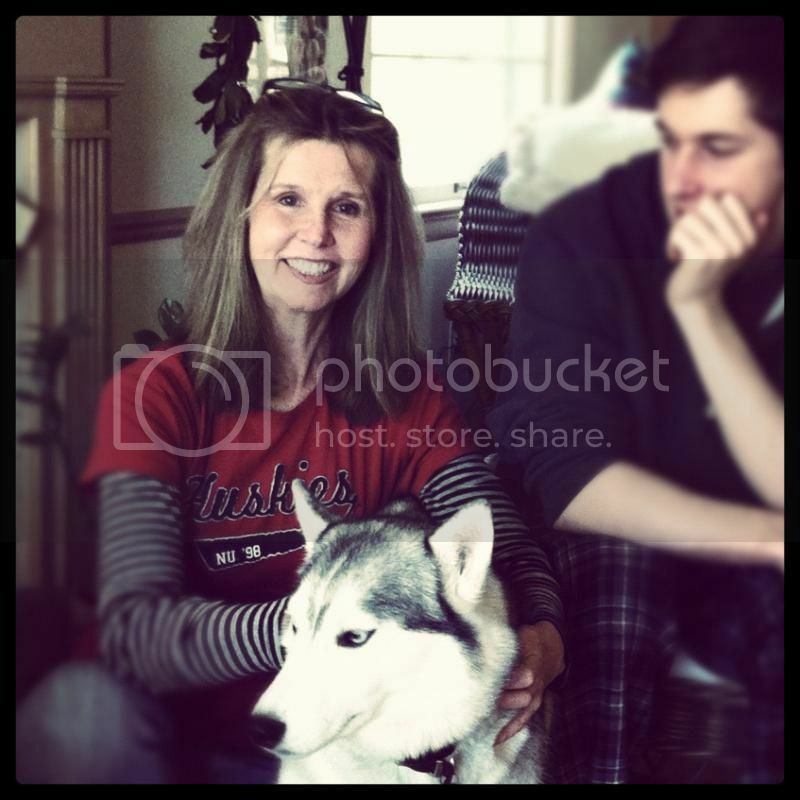 I can’t bare to spend the emotional energy needed to get through all these photos. It’s not inside me yet. I am not that strong. It makes me sad to see how much time has past. It makes me sad to see those I’ve lost, and what will never be again. Even when I look at the most precious pictures, I love seeing them, but it’s a very bitter sweet experience. My answer here is not the best. I am not going to sort them. That’s right. 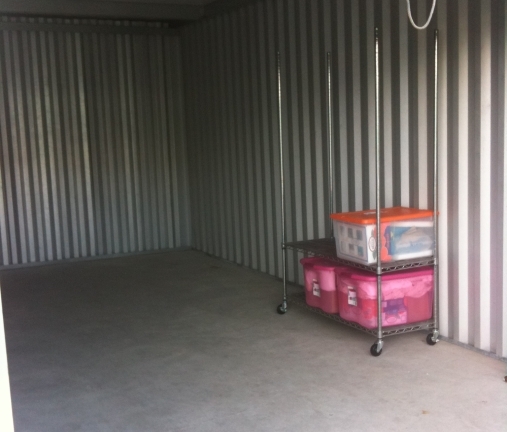 I bought three large blue bins and today my big contribution to de-cluttering is moving these bins to the storage unit. These bins are heavy and it is quite a task moving them. So it is a start, and it will be an accomplishment. My rationalization here is that when I finish sorting all the other areas of my life, then I will be free to leisurely look through a few photos at a time. Will I?… I don’t know. But I know I won’t let this become a roadblock to my journey to living better with less. 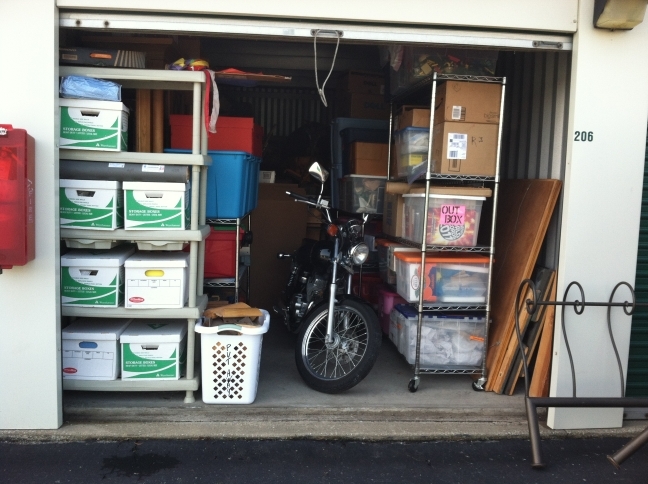 Tip: When visiting your storage space never look in any of the boxes. 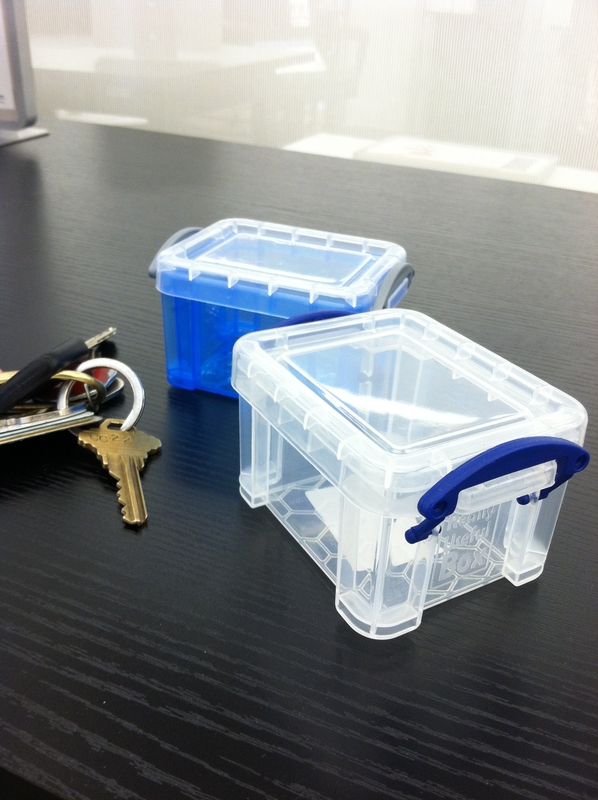 One-day one-thing: Store your photos safely, or sort some of them. This entry was posted in accomplishment, difficult, storage, task and tagged accomplishment, clutter, emotional, photographs, storage, temporary.